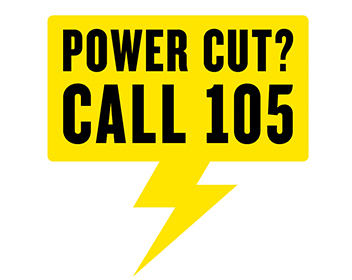 105 is a new three-digit number that people can call to report or get information about power cuts. You can also call 105 with any welfare concerns related to a power cut, or if you are worried about the safety of over or underground electricity cables or substations. You can also find more information at powercut105.com. Turn off meter/emergency control immediately and leave off until escape has been repaired. Extinguish all flames. Ventilate the premises by opening doors and windows. Phone the National Grid Gas Emergency Service free on 0800 111 999 (access to premises will be required by National Grid). Do not use any gas appliances that you think may have a fault. Ensure that all ventilation grilles and outside flues are never covered or blocked. Fit a Carbon Monoxide Detector. Be aware of the position of your gas meter and mains valve. Ensure that the National Grid Emergency Line number is in a visible place.